> Or perhaps you have? I have no doubt that many of the leadership books that pastors and Christians leaders are so strongly urged to read these days can have helpful insights from the business world, but here is a bit of a game changer or gospel paradigm shift to throw in the mix – just to help us all not to forget the gospel edge of ALL reflection we do about Christian leadership these days. 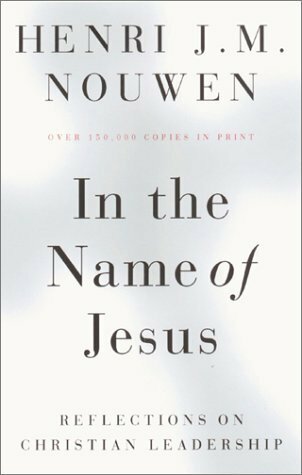 Among other great insights in this small book, Nouwen names three temptations: 1) the temptation to be relevant (countered by the discipline of contemplative prayer), 2) the temptation to be spectacular (countered by the disciple of confession and forgiveness), and 2) the temptation to be powerful (countered by the discipline of theological reflection). These broken, wounded, and completely unpretentious people forced me to let go of my relevant self – the self that can do things, show things, prove things, build things, – and forced me to reclaim that unadorned self in which I am completely vulnerable, open to receive and give love regardless of my accomplishments. >I think we've got to be contemplative, but we've also got to be relevant. If we aren't relevent people will disregard what we say. >Have you read the book, Jason? I haven't so I'm not sure what exactly is meant there. However, I think there's way too much insistence that WE be relevant instead of acknowledging that the only thing truly relevant is the Gospel, and we often just need to demonstrate how relevant it is.